/Mailing Service /How do I add my mailing service addresses? There are multiple ways of adding your Mailing Service addresses. Check out your options below. Importing contacts is fast, efficient, and perfect for someone with a lot of recipients. To import contacts, click the Import Contacts tab in your Address Book. Here you can either import contacts via a CSV file or by your Gmail account. Learn more about importing contacts via CSV files here. You can add contacts manually in your Address Book beneath the Add New Contact Manually tab. 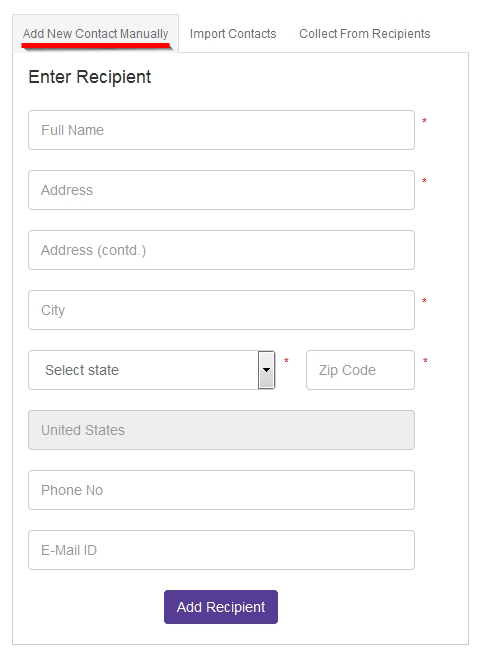 To do so, simply fill in the required fields and hit the Verify & Add Recipient or Add Recipient button. You can even collect addresses from recipients manually by clicking on the Collect From Recipient tab in your Address Book. Here you will see a link that you can copy and share with friends and family you’d like to add to your address book. Share the link on Facebook, via email, or via text. After receiving the link, your guests can click on it and enter their addresses manually. Check your Address Book to see who followed the link and shared their address with you. 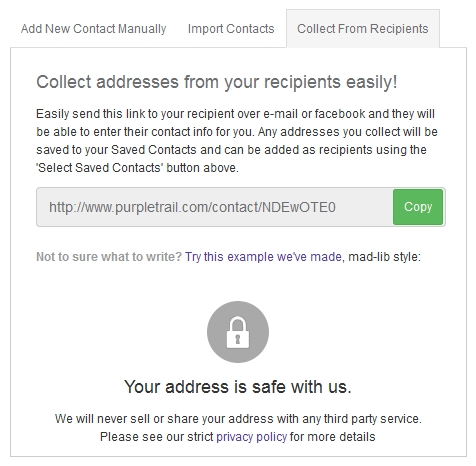 If you’re having trouble adding your addresses, please feel free to contact our customer service team for assistance at 425-484-1054 or 888-604-6089 between 8 AM (PST) and 4 PM (PST) on weekdays or by email at support@purpletrail.com.